If you’re struggling to work out what LinkedIn Status Updates to post this article is for you. 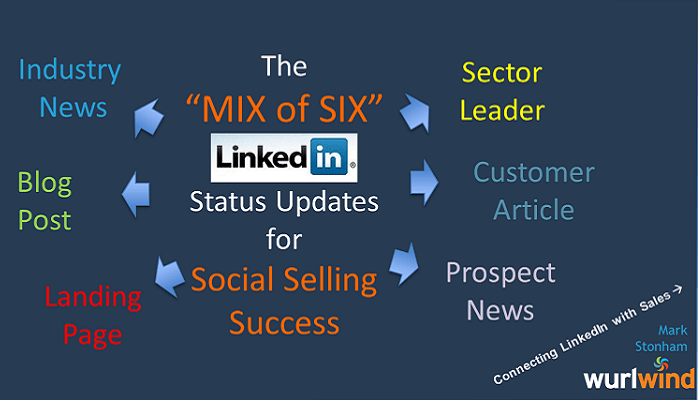 The “Mix of Six” LinkedIn Status Updates will help you to get much more from LinkedIn, whether you are an entrepreneur or business owner working on your own, whether you head up a business or a sales team, or if you are a sales person working for a company. More sales conversations with prospects. Once you get into the swing of this it should take you about 15 minutes a day to post these SIX updates. The following sections cover the six elements in the graphics, with an explanation about WHY, WHAT and HOW to build them into a plan and into your daily and weekly LinkedIn activity. While it’s great to have many connections on LinkedIn and be posting and sharing lots of great stuff it can feel very unrewarding unless there are specific results in terms of leads. From a sales perspective it’s important to identify who is moving forward in their buying process. Unless you put in place the mechanism to generate and capture leads it’s likely that your results will be disappointing. Sure, there are other ways that people can express interest in what you do. But having an online lead capture mechanism in place is a solid foundation. It can also be a great sales productivity tool too, as you can send an email to people to download an information sheet, ebook or toolkit after you’ve had a phone call with them, for example. Offering some ‘free’ information, such as a toolkit or report, in exchange for their email details is an effective way to capture their details. To achieve this you need suitable landing pages and ‘bait’ on your website, and ideally an email nurture sequence behind it to follow them up automatically. Then you create Status Updates that you post in LinkedIn with an attractive message inviting them to access the tool/report. These Status Updates can be pre-scheduled in Hootsuite or other apps so you don’t need to remember to do them every day. Tip: Think of what questions or problems your prospects have, and how you can create a valuable Checklist or Tool to help them. Then create the lead capture page. Then create a range of Status Updates, and Tweets as well, to bring visitors to the page. Advanced Tip: Set up Google Analytics Goals against the Thank-you pages beyond the Sales pages to monitor results. Include Campaign codes in the URLs as you get more sophisticated. Note: These Status Updates may well be shareable, if your Info offer or Toolkit is good. Show appreciation to those who do share them as this is hugely valuable to you. Articles that are educational are the bedrock of content marketing and social selling. Articles of 600 words+, with a strong headline, images and maybe video, do take time to create (say 2-4 hours). Therefore, pick evergreen topics that have a long shelf-life, and which are very applicable to your prospects and your personal branding. They should be written so they are very shareable, so not too salesy and promotional. Now that LinkedIn has introduced Pulse and opened it up to everyone this allows individuals to write long-form articles within LinkedIn. This is a powerful alternative to having to have a separate blog or a blog as part of a website. Tip: If you’ve not written a post in LinkedIn yet, write one. Then write a second, then a third, perhaps a month apart. You can pre-schedule Status Updates to attract readers to them using Hootsuite or equivalent. Check regularly for who has Liked and Commented as these are prime opportunities to engage with them, thank them, connect with them and start a sales conversation. LinkedIn has also updated the analytics and stats on articles to make this even more powerful and easy to do. Advanced Tip: Ask your colleagues, power group, advocates, key customers etc. to Like and Comment on them. Send them a request by Email within LinkedIn to a small distribution list is a good option. Be prepared to reciprocate – see later. As an expert in your subject you should be reading articles by respected industry sources. It may actually be worthwhile reviewing your sources and tracking down new ones. Having done that, pick an article a day, in your area of expertise, to share with your connections. Add some insight to it, highlighting an important element of the story, for example. Tip: Email newsletters from trade associations, research bodies and similar authority sources are a great source of articles. Advanced Tip: Install the Hootsuite Hootlet in your Browser and connect it to your various social media accounts. This is a very quick way to share a web page to LinkedIn, and to Twitter and other social media too. Who are the people in your specialist area who have created a powerful presence for themselves on LinkedIn? Not only can you learn from them about the subject area you can also learn how they are using LinkedIn. More importantly, by commenting on and sharing their material you are raising your profile with them, and also with the people who follow them. This has the potential to increase the number of people who visit your profile and accelerate your ability to reach out to others to connect. Tip: Search for your keywords in LinkedIn Pulse and see who is writing articles about your area. Choose to follow a couple of specialist Channels within Linkedin Pulse. Take a few minutes to look at their LinkedIn Profile and Activity. Like and Comment on 2-3 of their Status Updates and Posts. Follow them and also send a personal invitation to connect with them. Advanced Tip: Have a look at their Connections, and see which Connections you Share. This may indicate people in your network who are actively researching a topic on LinkedIn, and an opportunity to re-engage with them. Alternatively, it may indicate peers who could become part of your power group, where you can actively support each other on LinkedIn, by sharing on a reciprocal basis. Super-Advanced Tip: Becoming an Industry Leader whose content is shared by many people is an aspiration that some people are able to turn into reality. It takes dedication and commitment to achieve, and infrastructure to monetize it as well. What is amazing is that LinkedIn provides the vehicle, for those who want to make this journey. Sharing content created by your customers has many benefits. This includes maintaining your relationship with them for repeat business, as well as testimonials, referrals and other sales related pay-back. The other side is that you are actively raising the profile of their business to your connections. The more successful your customers are the more likely they are to refer you and give you more business. Tip: Take care to share quality material that is reasonably consistent with your personal brand and relationship. You may need to visit their website, LinkedIn Page or the profiles of senior executives to find suitable pieces. If you add the name of the author into the status update you create your contact will be alerted to the mention, giving you kudos. Advanced Tip: Create a Tag Group within Contacts for your prime customer contacts – and ideally they will be 1st connections. Now set a reminder in LinkedIn in the Relationship Tab for each contact for 1 month and recurring. And check the ‘Keep in touch’ area regularly! You can also send an email within LinkedIn to this group, perhaps asking them to Like one of you articles. If your target list is senior executives, business owners, or other hard-to-reach people, you can improve your chances of getting through by sharing their content on LinkedIn. It helps if your target people are present and reasonably active on LinkedIn, otherwise you may need to look for alternative strategies. Tip: Search the Internet for Press Releases by your prospect, case studies, senior people being quoted in the news, etc. When you find one, create a positive status update highlighting the ‘good news’ and giving the key person a name-check. If they see it, or pick up the email notification, then it could start a conversation. If they don’t see it there’s no harm done. Doing a “I found this article and thought you’d find it interesting…@mention “ type of message could well be seen as intrusive, and doesn’t look good in your own Recent Activity stream either. Warning: Do this in moderation, otherwise every other connection you have will be flooded with random status updates if you share say 50-100 items a day in an attempt to get noticed by prospects. On the 1:6 basis, be very strategic about choosing which prospect you are trying to get through to before sharing their content on LinkedIn. The alternative, for higher numbers of shares is Twitter, if they are active there. Before you start ramping up your activity in LinkedIn it’s worth check that people can see your Recent Activity and can Follow you. Go Into Settings / Profile and Privacy Controls. The Second Line is “Select who can see your activity feed” – I suggest you select Everyone or Your Network. The Sixth line is “Choose who can follow your updates” – I suggest you select “Everyone”. Ask a colleague to view your profile to double-check. To be fair, planning, sourcing and developing some of these elements if you don’t already have them will take time. However consider it to be an investment as it will have a long term payback. Monitoring and following upon the sales conversations that this starts, through LinkedIn, by email, over the phone etc. is then part of regular sales activity. I suggest, set yourself an activity based goal over a 20 day period, to research, set-up and run with this plan. Set aside half a day to re-read this article and to work through the planning worksheet which you can get below. Then set aside 30 minutes a day – and be focused about finding and posting suitable articles, and not wandering off on interesting thought lines, triggered by what you find during your activity. Creating a Worksheet, like the one I have that you can download below, may take you an hour or so. Writing articles takes longest, and is the most frequent activity, so prepare ahead. This article, and graphic, and the Linkedin Post to go with it has taken 6 hours. However, if it generates half a dozen inquiries and 3 sales, and saves me time repeating myself, and raises my profile, it’ll be time well spent. Sales people working in small, medium or large businesses may well be able to use articles written by the business owner or other specialists in their business rather than writing their own articles, at least initially. To help you research and organise the websites and pages you need I’ve prepared a short worksheet. Work through the SIX sections, find and record website URLs on the sheet, so you have them all in one place, to use and to add to. Then use the document to work through day by day to write and post status updates, and record your progress. Until I get a Form set up you can request the Worksheet by emailing me: Mark Stonham here. If you’ve found this useful please Like and Share this page.